Luscious French Boudoir Cap from the early Art Deco period, 1915, this is an amazingly rare example. I have bought and sold these confections for over 15 years, this is the first one I have ever found with this detailing. 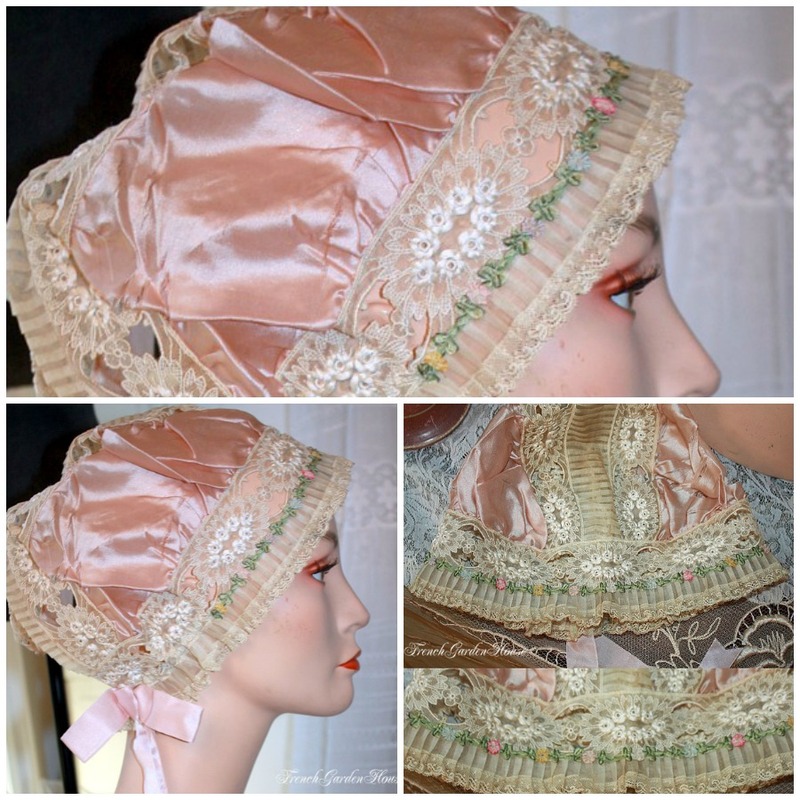 Boudoir caps were worn to keep hair in place while asleep or sometimes to protect a lady's hairdo while dressing for an afternoon "out" or a gala evening engagement. Made entirely by hand of the finest French Silks, Laces and Ribbons, they were often a part of a bridal trousseau, treasured and displayed, but sometimes barely worn. This finest piece comes from an old family, an estate collection. 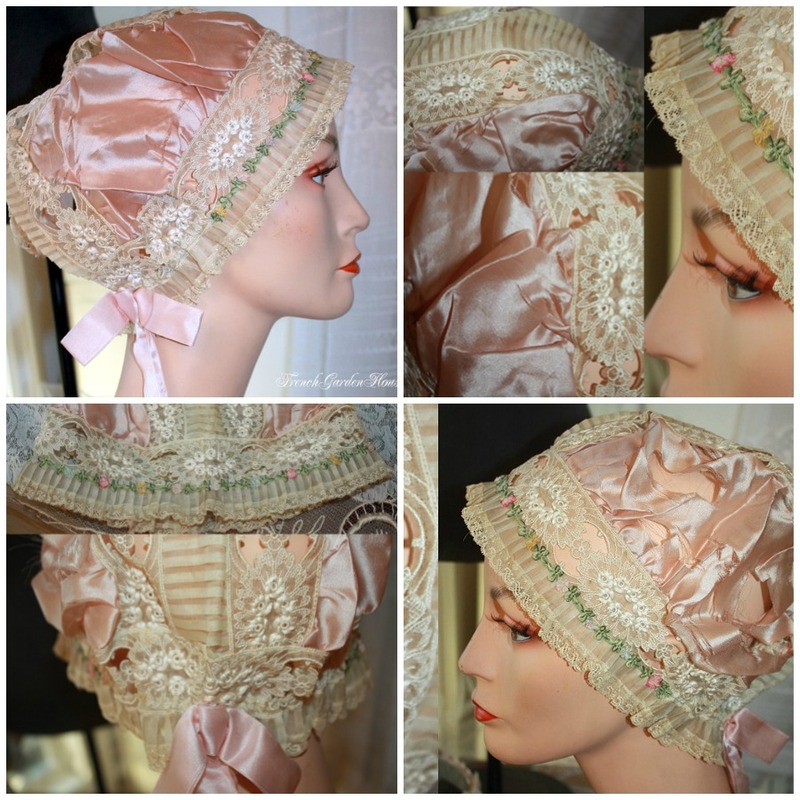 Finest French silk, hand embroidered organdy lace and ribbonwork transform this silk boudoir cap into a delicate confection of femininity. Frothy gathered organdy Lace trim goes all the way around the cap, it is covered with the most delicious of French Ribbon Rosettes garland around the cap, then a cut work organdy embroidered band, completely covered with hand embroidered roses, eight thick embroidered blooms around each oval detail. Divine! The band covers the whole head area of the cap, as well. So romantic, and feminine. Despite the shattering of the Lavender Pink silk, I couldn't resist this piece, it truly is a rare example, quite ornate, but can be used for display only. The silk can be replaced, of course, should you wish. I have left it as found, to be lovingly displayed in your boudoir as part of your collection.